Instant Saving on any new Ductless Mini-Split Air Conditioner and Heat Pump. Super quiet operation. High energy efficiency. No air ducts needed. Fast installation. Low prices. Large selection of efficiency ratings. Get ready for next hot humid summer. For many Twin Cities metro residents, home heating uses a hot water boiler and there is no ductwork available or room to install air ducts. Hot water heating works very well, but is not very energy efficient, especially during the spring and fall, when only minor heating is required. In addition, these homes are difficult to cool the Minnesota’s hot humid summers, since standard ductwork is not available for installation of a central air conditioner. For these homes, supplemental heating during the early and late heating season, along with efficient air conditioning is no longer a dream. 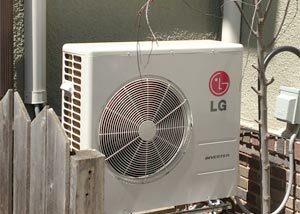 LG air source ductless air conditioners and heat pumps can fill both needs, eliminating noisy window AC units and supplying cool air right where it is needed. During the fall and spring season, these heat pumps deliver quiet, comfortable heat through energy-efficient operation. When the outside air temperature drops below freezing, the hot water boiler or natural gas furnace takes over. 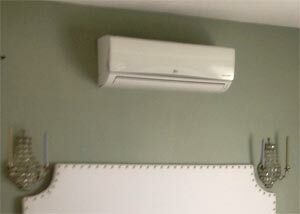 Ductless air conditioning and heating is also very useful for room additions, where adding ductwork is impractical. The LG ductless mini-split AC and heat pump has set the industry standards by its durability, high efficiency, affordability and flexibility. It is easy to install and can fit just about any room in any home, whether you need to cool one or multiple rooms. The availability of this new technology has eliminated the need for ugly, inefficient window AC units. There is no need to install a central ductwork system, reducing the cost and time of installation. You can set the heating or cooling temperatures with a remote control. With several colors to choose from, the indoor units blend naturally with your interior design and decoration. When heating and cooling a single room or area is the goal, an LG single zone ductless air conditioner and heat pump is the solution. Available in a range of capacities, it uses a small, quiet outside unit and a small, exceptionally quiet inside unit to supply both hot and cool air. It eliminates more noisy window air conditioners. The efficient green heating during cool seasons makes it perfect for every room in the house. 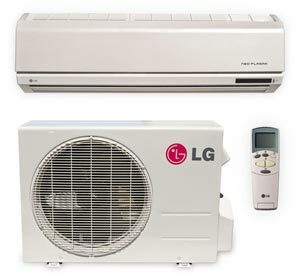 LG Ductless mini-split systems are affordable and easy to install. When you need to heat and cool multiple rooms, LG has a solution. Using a single outdoor unit that feeds up to four indoor units, you get all the benefits of environmentally-conscious, efficient heating and cooling. Quiet warmth and heating without using your less efficient hot water or other system makes these systems ideal for many installations. No ducts are required, and the temperature can be set separately in each room. Given its heating and cooling functions in one unit and its high energy efficiency, a ductless mini-split AC and heat pump is a smart investment. If you’d like to know how much a ductless AC and heat pump costs, we will be happy to provide you an in-home estimate. Because the LG models vary in size, capacity, efficiency and price, it is necessary to have a clear assessment of your heating and cooling requirements before choosing the right model. As a leading residential heating contractor in the Minneapolis St. Paul area, we offer competitive pricing and deals with great savings. Our Minnesota heating and cooling company is proud to offer these revolutionary LG ductless heat pump and AC systems to answer the needs of Twin Cities homeowners who are limited to ductless heating and air conditioning. The quiet, efficient operation of these ductless HVAC systems makes them a terrific choice to replace a hodge-podge of window and other units in homes with hot water heating systems and for other special situations. Contact our HVAC company to discuss the many options in capacity, configuration and price. They’re available in many sizes, with one just right for your home. One of our expert consultants will be glad to show you just how convenient and quiet air conditioning and cool weather heating can be.